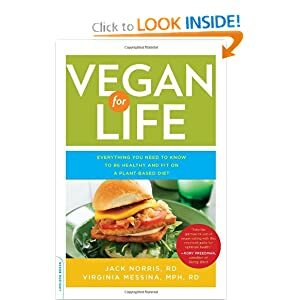 I eagerly picked up Vegan for Life: Everything You Need to Know to Be Healthy and Fit on a Plant-Based Diet by Jack Norris and Virginia Messina, two registered dieticians, as soon as I saw Virginia at Vida Vegan Con. She spoke on a panel (fittingly) about vegan nutrition, and afterwards, I couldn't wait to read even more about what she had to say on the subject, since she referred to the book a lot during the panel. Having deficiencies in both Vitamins D and B12 can be detrimental to your health, so take supplements of both. Soy products really are okay to eat as part of a plants-based diet and can even lower cholesterol. Just limit them to 3-4 servings per day. There is limited information about the long-term health of vegans, which makes it difficult to report statistics and compare facts or results with other studies. The book includes some helpful meal planning, even broken down by target caloric intake. There are sections based on stocking the vegan pantry and different ways to prepare and eat beans. 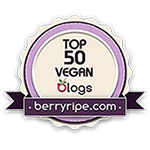 The final chapter describes the benefits of going vegan: it describes in depth the poor treatment of animals raised to be eaten. One cannot help but feel moved into action. I suggest you read this if you are already a vegan or are contemplating transitioning to a vegan diet. The information is too valuable to pass up.